You know that summer time is here when you see Grandma pulling one of these delicious desserts out of her oven! Remember those times during summer vacation when you would stay at Grandmas house and be filled with so much yummy food that you felt like your stomach was going to burst open? You'd always end up going back home with clothes that were way too tight. That was one of the best part of visiting the people you love, they would always want to make sure that you had your fill. This vape juice blend is going to bring to mind all of the different fun times that you would have and have an amazing loving feeling well up inside of your heart. If you close your eyes you can easily picture your sweet Grandma asking you to go down to the field and pick her a basket full of berries. You'd eagerly run down to the closest field and start picking but it would take what seems like forever for you to fill that basket because you'd be eating so many of them as you went along. When you'd come back, Grandma would tell you all about the delicious plans that she has for them. Granny's Pie E Liquid is a line of vape juice blends that are made with a skill and hand crafted feeling that is going to drive you wild. It's everything that you have ever wanted and more in a vape juice line for their well rounded style and extremely balanced flavors. Strawberry Pie begins with a buttery, flaky crust that is then filled with cut up, perfectly ripened strawberries with a bit of sugar over top. 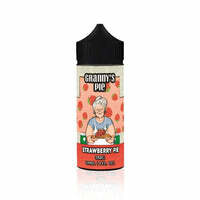 Strawberry Pie - Granny's Pie E Liquid has a rating of 3.0 stars based on 2 reviews.